Greenish Thumb: GTTC: pizza and giveaway winner announced! GTTC: pizza and giveaway winner announced! I don't know why we don't make pizzas more often - they're cheap, quick, fun, and incredibly tasty - especially when topped with summer goodies from the garden! The version on the left is topped with arugula pesto, fresh mozzarella, tomatoes and prosciutto. The version on the right is just brushed with olive oil and topped with garlic and herb goat cheese, tomatoes, and purple basil ribbons. The variation below was made by the little one who enjoyed making it much more than eating it. This week, I chose a name from all the GTTC entries made during this season. Holly from Tasty Travels is the winner of the Barefoot Contessa's Back to Basic's cookbook. Holly cooks up some incredible meals using the bounty from her plentiful garden. I'm not sure how much she needs a "back to basics" cookbook, but hopefully she'll find some inspiration! Want to join the Garden to Table Challenge? Simply post about how you're using your garden harvests (or fresh market purchases), link back to the weekly GTTC post and link below. 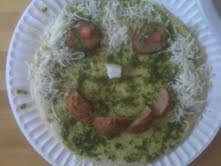 Ok....the pesto pizza looks delicious! YUM! The pizza looks yummy! I wish i can make one! You got to love homemade pizza. I did get to use my own fresh parsley and thyme. Otherwise, my garden is pretty much done, although I'm still getting the occasional tomato. Have a great week Wendy. "Even the raccoons don't want your tomatoes"